If you’re wanting home-grown eggs but don’t have quite enough room for chickens, keeping backyard quails are a super option – they’re easy care, lay protein rich eggs, don’t need much space and are great fun to have around. 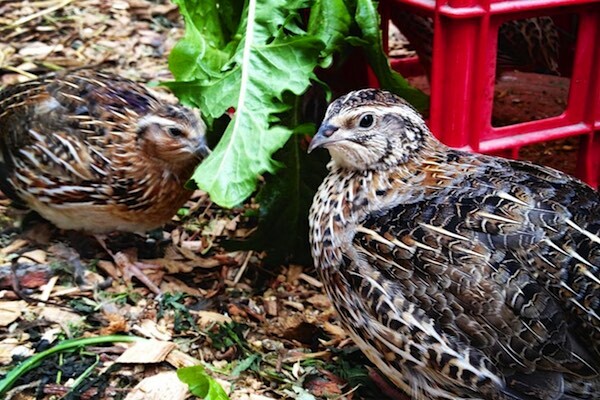 There’s many different breeds of quails, and some are more suitable for backyards than others. Let’s start with Japanese Quails (Coturnix japonica) which are a popular multi-purpose bird – they lay well, are resilient in most weathers and are generally a good choice for backyarders. Japanese Quails are a small ground-dwelling bird native to grasslands in East Asia and Russia. Probably the most popular domesticated breed, they’re bred and kept widely for their their excellent egg laying rate and palatability. 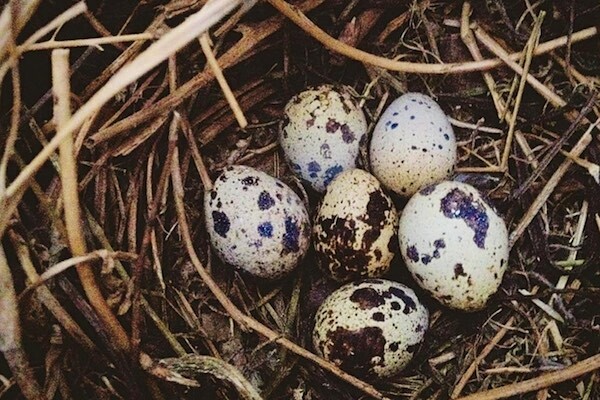 They’re also the only quail to be able to claim the questionable honor of being incubated and hatched in space, aboard the Mir Spacecraft in 1990. We’re not sure why either, but there you go. Highly adaptable little birds they clearly are. 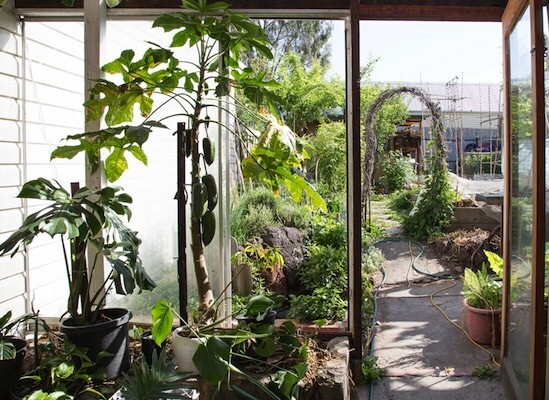 To understand the basics of what’s involved in keeping quail, and why they’re so great, we had a chat to Kat Lavers – an urban homesteader from Melbourne, who keeps Japanese Quail at her small yet delightful retrosuburbia-esque abode, The Plummery. 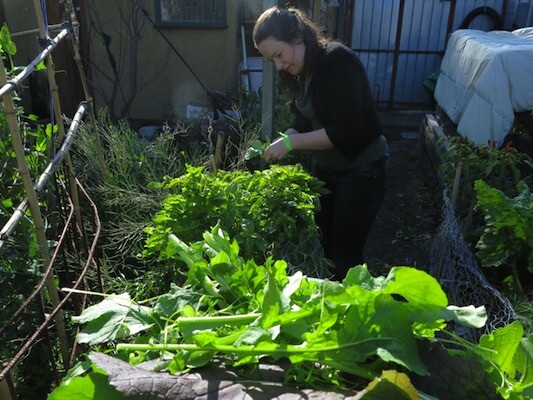 Kat has chosen quails as an appropriate addition to her permaculture system based on her context of a small urban household with some soil contamination issues, as another way to produce good food above ground, using waste from other parts of her system. 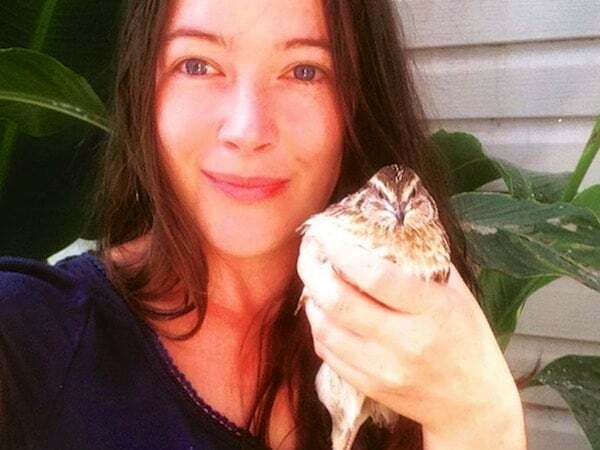 Kat gave us the lowdown on how and why quail-keeping makes good sense for folks with a backyard and a longing for home-grown protein. Kat chose quails over chickens primarily because her backyard is small, and in an inner-urban suburb. 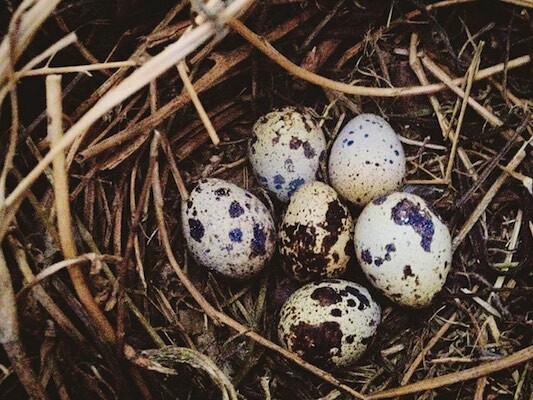 Her other considerations were that quail are more efficient that chickens at converting feed into eggs – something to consider in a small system. Added to the fact that they’re easy to care for and keep happy, and the fact that they lay an average of 300 eggs each a year, Japanese Quail sounded like just the thing for her place. Kat keeps her 16 Japanese quail in a netted-in pergola, which is more than enough space for them. As they’re ground dwelling birds, they don’t tend to perch, but rather just hang out, and sleep, on the ground of their coop. Like any kept bird, they need protection from weather and cold winds in order to thrive and not spend all their energy on keeping warm and safe – that same energy that you’d rather they use to lay eggs. Kat incorporates a deep litter system of leaves and sawdust for the base of the quail’s coop which is comfortable for the quails feet, absorbs their poop, allows them to scratch and forage for insects in the bedding and slowly over time creates a great layer of compost that can be periodically harvested for the veggie garden. Kat chooses not to free-range her quails – though they fly very rarely and only when they’re startled, when they DO fly they can zoom up to 2m high, which could see them accidentally get over her fence and into the unknown. She has plans for a quail tractor (like a chicken tractor but cuter) next Summer to get the quails onto her garden beds as part of the bed rotation. Kat feeds her quails a mix of a game bird grain mix (though she’s looking at ways to convert this part of their diet to something more closed loop) as well as kitchen scraps, spent vegetable leaves (and caterpillars if possible) from the garden plus worms from her worm farm. Kat also loves how they convert masses of weeds like chickweed (which is tasty and edible, by the way) into protein-rich eggy goodness. Black soldier fly larvae are another occasional protein source. 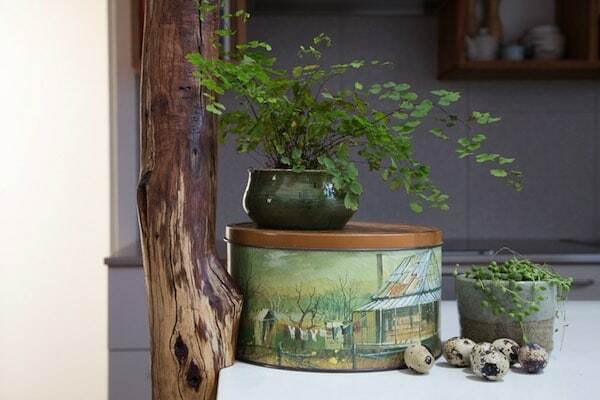 Other good food ideas are duckweed and azolla, common water plants in many garden ponds which are easy to grow. 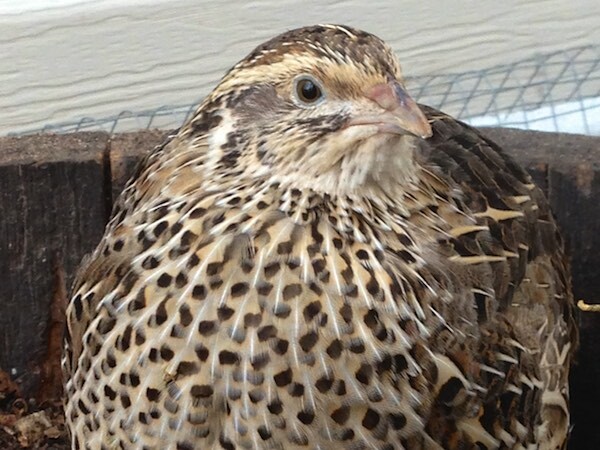 On this mixed diet made up mostly of food waste, Kat’s 13 female quails lay roughly an egg a day over the warmer months, which works out as about the volume of 1 dozen chicken eggs a week. 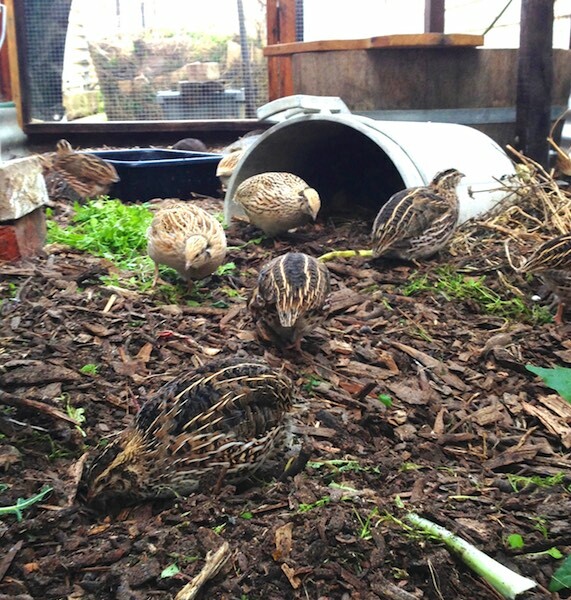 Quails laying behaviour is light dependant, so they do taper off in Winter. However when I spoke to her, three weeks out from Winter solstice, Kat was still getting at least 5 eggs a day. Quail eggs are smaller than chicken eggs – about 5 quail eggs equal the weight of one large chicken egg. However, quail eggs have more protein in them, and also have a larger yolk (relatively speaking). 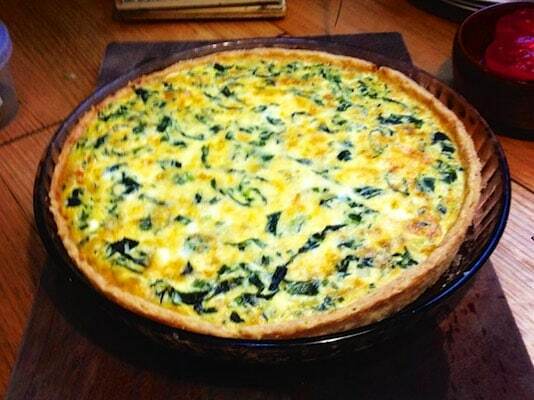 Kat uses her quail eggs just like chicken eggs; fried, in omelettes, frittatas and in baking too. They’re suitable for anything you’d make with chicken eggs, except meringue perhaps, given there’s less white. Never mind, you can make more custard instead with all those awesome yolks. No problems here. The Japanese Quail is considered a prime multi-purpose bird, meaning that it’s suitable for eating, along with it’s eggs. In backyard systems like Kat’s, only the extra males are harvested as an occasional surplus harvest. Quails are considered very suitable for small-scale meat partly because they’re easy to dress – generally they’re skinned rather than plucked, as the skin slips off easily, for quick processing. Here’s a good little video of the dressing + gutting processes. An excellent source of home-grown, low footprint meat. 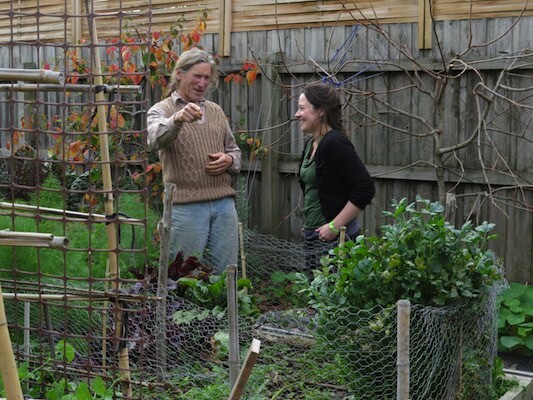 In Kat’s backyard, the quails are integrated with the veggie patch and household as waste processors. There’s many folks using quails in stacked backyard and small farm systems in other ways that utilize the quail’s space efficiency, waste processing and foraging characteristics, like in this rabbit, quail and worm system. And just like chickens, quails are excellent company to have around. They’re not noisy, delight in the scraps when fed, and apparently watching a quail eat a whole big compost worm is something else (think giant spaghetti). All in all, there’s many reasons that quails make sense on a backyard scale – especially in a system that’s striving for as much inter-sufficiency as possible. From their impressive feed-to-protein conversion rate to their ability to turn kitchen and garden waste directly into dinner, quails are something to consider if you’re looking for home-grown eggs and maybe occasional meat from an efficient system that’s suitable for urban living. Thanks to Kat for her quail-ish insights! You can follow Kat’s inspiring retrosuburbia journey here on her instagram (website coming soon). 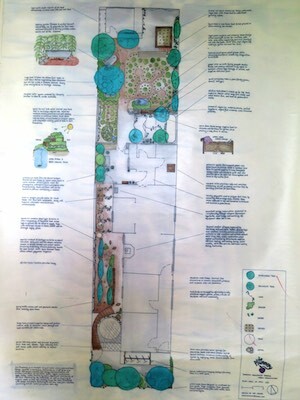 Interested in designing your own urban permaculture system for good food, energy efficiency and resilience? 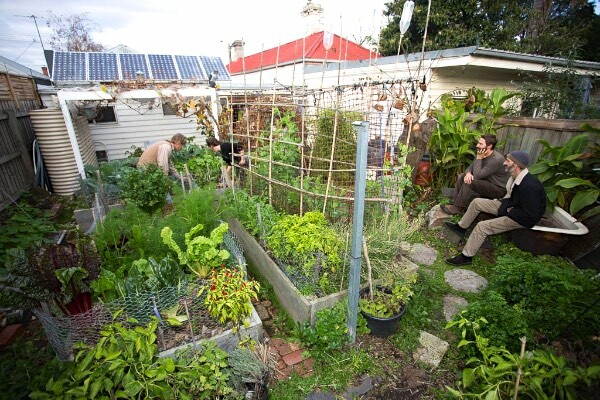 Join us at an Intro to Permaculture course if you’re in NSW, or check out our Permaculture Design archives for good ideas, books and inspiration. Pictures: all by Kat Lavers except 2 by Oliver Holmgren, 3,4 + 14 by Eunice, and 5+15 by Emma Byrnes . 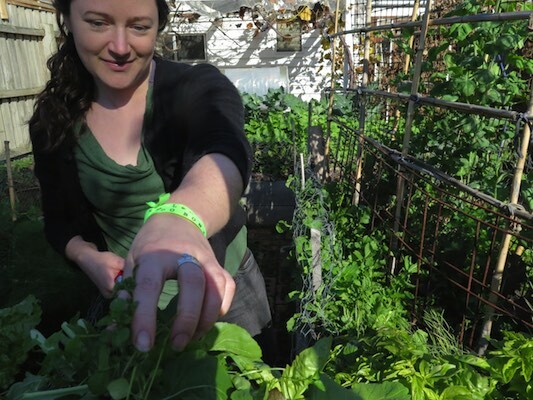 Last weekend we gathered with a crew of local folks to harvest + . .
Great article. I raised Japanese Quail for a few years for meat and eggs. 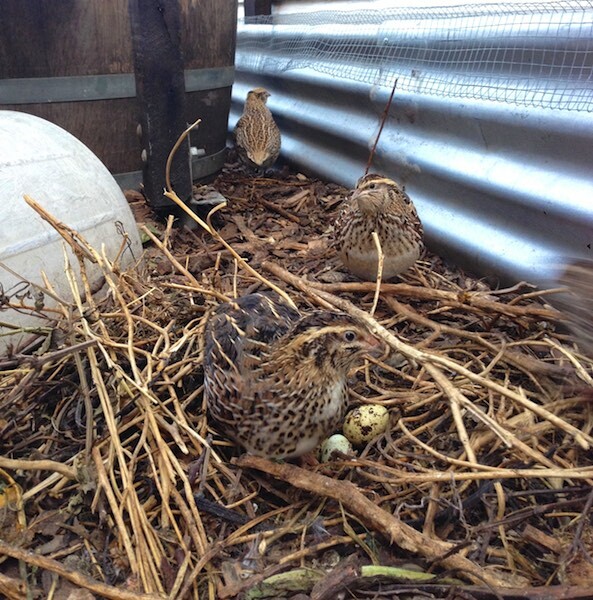 Although quail don’t tend to ‘sit’ on their eggs to incubate them, they can be hatched quite easily in an incubator. It’s amazing that a newly hatched chick can be producing eggs in 7 to 8 weeks and/or breeding. While quail are generally quiet, the male (rooster) has a loud call when searching for girls. It’s a quick turnaround if you have the time for feeding and processing the meat. To compliment your article I’ve included my blog with my adventures with quail… http://illawarraquail.blogspot.com.au/ please note though, we don’t have quail anymore.